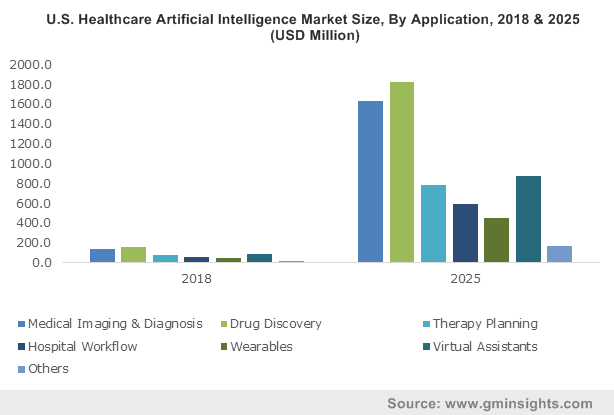 Healthcare Artificial Intelligence Market size was valued at USD 1.3 billion in 2018 and is expected to witness 41.7% CAGR from 2019 to 2025. Growing application of artificial intelligence in the field of drug discovery, medical imaging industry, precision medicine and genomics coupled with increasing personalized treatments customized to an individual patient’s requirement will drive the global market. Rising demand for artificial intelligence technology to perform data mining and accelerate the speed of healthcare delivery services, emergence of novel and promising applications for disease diagnosis and monitoring will further augment the market growth in forthcoming years. Advancements in data analytics will surge the healthcare artificial intelligence market growth during the analysis period. Huge amount of data is generated every year in healthcare industry and ever-increasing volume of big data has generated the need to adopt artificial intelligence technology to manage data efficiently. Artificial intelligence has revolutionized the field of healthcare by designing treatment plans, assisting in repetitive tasks, medication management, and drug discovery. It can also be effectively used for healthcare data management by collecting, storing, and normalizing the data. Recently, the artificial intelligence research division of the Google, launched its Google Deepmind Health project, for data mining of medical records to provide faster and better health services. Development of technologically upgraded data software and solutions will foster the industry growth. However, high capital requirement may create affordability issues and hamper the industry growth. Drug discovery segment accounted for USD 345.0 million in 2018 and is anticipated to have significant growth during the forecast timeframe. Drug discovery is one of the recent applications of artificial intelligence that has transformed drug discovery process and can be used to cut the cost of production for new drug development. Astra Zeneca recently entered into collaboration with Berg, a Boston based specialist in artificial intelligence for drug discovery. Such ongoing initiatives from industry players are bound to have positive impact on industry growth. Hospital workflow segment held considerable revenue share in 2018 and is anticipated to witness 40.6% CAGR during the forecast period. Increasing adoption of artificial intelligence technology for collection of data of patient to support decision making in hospital workflow has significantly improved outcomes, reduced wait times and costs that will enhance segmental growth in forthcoming years. 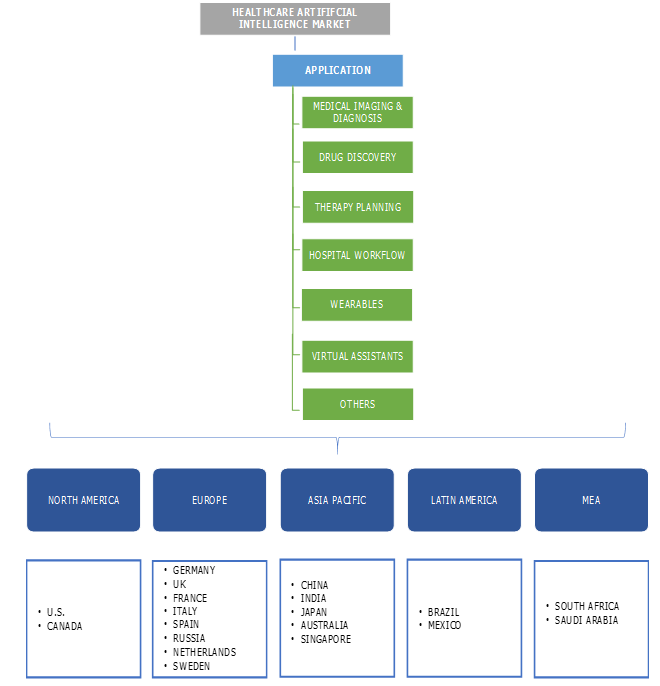 North America healthcare artificial intelligence market dominated the global market with USD 653.9 million in 2018 and is anticipated to show similar trend over the forthcoming years. High regional growth is attributed to massive adoption of HCIT solutions and increasing focus on population health management. Moreover, various government initiatives and funding in North America are focusing on encouraging the growth of healthcare artificial intelligence market. Asia Pacific healthcare artificial intelligence market will witness lucrative growth of 44.4% over the forecast period due to rising R&D expenditure, developments in pharmaceutical and biotechnology sectors. 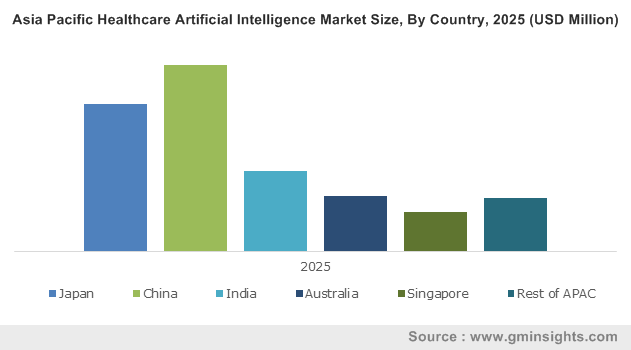 Additionally, presence of large patient pool will trigger demand for better healthcare services, developing healthcare infrastructure and rising disposable income will further support Asia Pacific healthcare artificial intelligence market growth. 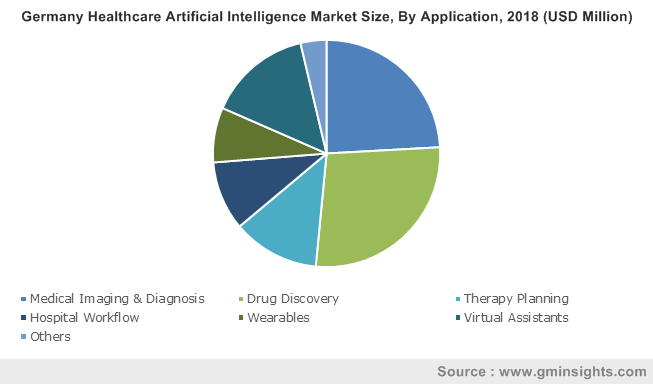 Some of the key industry players operational in the healthcare artificial intelligence market include AiCure, APIXIO, Inc., Atomwise, Inc., Butterfly Network, Inc., Cyrcadia Health Inc., Enlitic, Inc., IBM (Watson Health), iCarbonX, Insilico Medicine, Inc., Lifegraph, Modernizing Medicine, Pathway Genomics Corporation, Sense.ly, Sophia Genetics, Welltok and Zebra Medical Vision Ltd. Leading players operational in healthcare artificial intelligence industry adopt several strategic initiatives such as mergers, partnerships, collaborations, acquisitions, new product launch and geographical expansions that will allow the companies to sustain market position. For instance, in March 2017, IBM announced global strategic partnership with Salesforce for delivering joint solutions to the companies to make smarter decisions using artificial intelligence. Partnerships with strong leaders will foster company’s growth. Over the past few decades with technology upgradation, companies such as IBM Watson have introduced software and solutions that have seamless applications in healthcare industry. Since the introduction of healthcare artificial intelligence, industry has experienced numerous growth opportunities. Several industry players initiated the development of data analytic software for handling and processing large amounts of patient data generated. Artificial intelligence was initiated in 1956 and started gaining significant importance in medical field since 1972. The programs and solutions introduced, facilitated the process of drug discovery. Currently, the players have started addressing the identified gaps in healthcare services and have developed applications and solutions that are aimed to enhance productivity at hospitals and clinics by providing exceptional operational ease. Also, efforts are been made to introduce artificial intelligence based surgical robots that will help in reducing surgical complications. As this industry is still in initial phases of growth, key industry players will leverage advanced technology to conceptualize and market highly upgraded and reliable software that will probably replace the conventional systems utilized earlier proving beneficial for the industry growth.